The Prowler is a powerful piece in an alternative version of chess. In the standard board depicted below, we have an initial setup of white pieces and just one black prowler. 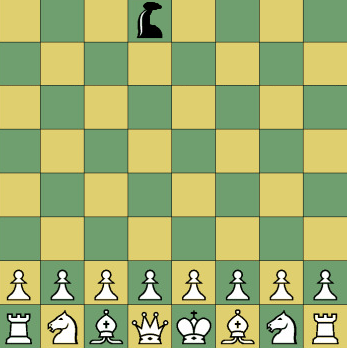 The game does not end when the king is captured: it ends when all pieces of one color are captured or by traditional draw rules (stalemate, repetition, etc). The question: White starts the game. What is the minimum number N of black prowlers you would need to force a win? It is not possible to force a win with N = 1. Easy way to demonstrate it: you can't capture the opposite queen AND the king, as long as they stay next to each other. So, if you capture one of them with the prowler, the other will capture you. Three prowlers to force a win. Assume there are only two. White's first move is Nc3, since this forces black to capture XxRa1 (or Q/K) - otherwise Rb1 would mean that Nc3/Rb1/Pb2 was a closed protected cycle and Qd1/Ke1 would be as well. White's second move can then be Nf3, which forces XxRh1 (or Q/K) by the same logic. At this point, Qd1/Ke1 is a closed protected cycle. But whichever is taken, Pd2/Pe2/Nc3/Nf3/QKd1 or QKe1 is still a protected closed cycle, and white can stall indefinitely with d1>e1>d1>e1, etc. Taking a different piece (Nc3 for example) leads to Pd2xXc3, while Qd1/Ke1 is still closed and protected. If black chooses to capture Q or K earlier instead of Ra1 or Rh1, white just captures Qxe1/Kxd1, and now only needs to construct a single protected cycle - this means that black must capture both Rooks before white can move them, which gives white time to move both knights and set up the original Pd2/Pe2/Nc3/Nf3/QKd1 or QKe1. Note that we do also need to prove that a tie can be forced if Black captures Q>K, at which point neither piece can be our method of stalling. Assume without loss of generality that Ra1 was the rook that survived to enable this play. In this case, we have at least Nc3/Ra1/Pb2/Pd2/Pe2/Pg2/Nf3/Bc1. To force a tie without leaving any piece unprotected, just go Ra1b2 > Pd2d3 > Nf3d2 > Nd2e4 > Bc1g5, at which point Nc3/Ne4/Bg5-f6 is a tie. Thus, white can always force a tie against two Prowlers. Aside: A counter play to Daedric's argument of zugzwang after capturing both rooks. Nc3 > XxRa1 > Nf3 > XxRh1 > Pe3 > XxBc1 leaves Ke2-1 as a double protected stalling state. The pieces involved in this are Nc3/Pd2/Qd1/Ke2-1/Nf3/Bf1/Pg2. Each of these pieces is protected by some other piece for either King move. Capturing Nc3 gets recaptured by Pd2. Capturing Pd2 gets recaptured by Nf3. Capturing Nf3 gets recaptured by Pg2. Capturing Bf1 gets recaptured by Ke2-1, who is still protected by Q, who is protected by Nc3 - next turn, king moves back next to queen. Capturing Pg2 gets recaptured by Bf1. Each of these leaves QK forever adjacent, with Ke2-1 a draw. The other options are capture Ke2-1, which gets recaptured by Qd1, which then becomes Qd1-e1, alternating being protected by each knight. Or capture Qd1, recapture with Nc3 (which leaves everything still protected) then Nd1c3 > Kd1-e1 is a draw. However, to prove that three is sufficient, you'd need to show that Nc3/Ne4/Bg5-f6, Pd2/Pe2/Bd3/Be3/Nf3-d4, or an equivalent setup can never be forced by white while capturing two prowlers during the loss of K,Q,R,R. However, given that just a knight/bishop/pawns can't stall indefinitely, we can at least show that four prowlers is good enough. XxRa1 > ??? > XxRh1 > ??? > XxQd1 > [captured] > XxKd1 > [captured] loosing only two prowlers can be followed by two more captures (either knight and either bishop) at the cost of a third prowler (there's no way to shield both knights and both bishops in time, so at least one of those captures is free) which prevents a stall. Thus, we can at least say that four prowlers can always force a win. While not a full proof, I can offer a (hopefully) convincing argument that three is sufficient. If white moves any pawn as their first move, black can capture whichever rook is on the same side of the board as that pawn. If white's follow up is anything other than a knight move, black can respond by capturing queen or king (whichever is less guarded) forcing white to capture back, at which point black captures the other unguarded one, then can capture the other rook and one of the knights with only one lost prowler. There are a lot of ways this can go down, but I feel confident in saying that pawn-first, non-knight second is not a winning (tying) line for white. So, without loss of generality, let's say white starts on Nc3. Black can then go XxKe1, forcing capture from the only protector, QxXe1. But now XxQe1 is a safe move, and black's only lost one prowler. White needs to set up a protected cycle immediately, so Rb1 is the only sane play - anything else lets black snipe both rooks for no cost. Black's response is XxRb1, forcing the capture of NxXb1 - which is unprotected now, so XxNb1 snags a free knight. At this point, there's no single move that can protect the other rook, so white makes any move ?? ?, and black responds with XxRh1 (safely). No two moves can protect both bishops, so black also gets to capture one of them for free. From this point, white has one bishop, one knight, and a bunch of pawns. There's no way to stall infinitely with those pieces, so black wins (eventually). If white starts on a pawn move, followed by a knight move, black should just eat the rook on the same side as the pawn that moved and proceed as above from there. Again, this isn't a solid proof, but it is a persuasive argument to the effect that black should be able to capture Q,K,R,R,N,B with only two losses - thus allowing them to win with three prowlers.